The Tauer era will come to an end this year with an election of a new mayor of Aurora in November. Ed Tauer and his father, Paul, are the only mayors Aurora has known since the citywide elected office was created in 1995. The frontrunner for the job is former Aurora City Councilman and political activist Steve Hogan. He began politics as a Democrat, but is now a Republican. At his announcement, he had already collected $100,000 in contributions. This may be another low-key mayor’s race. Ciruli believes Trump’s polling numbers are tied to his celebrity status and high name recognition, two things that may not carry him. The Democrats look aggressive with their controversial reapportionment maps that tried to create competitive districts. Their strategy was to use competition to give them a better shot at two additional seats out of seven. But, the map ignored communities of interest and had little support. The Republicans, in an effort to hold and improve what they have (4 seats), just modestly moved the lines. Unfortunately, political missteps at the end made them look politically self-serving and confused. Unless leadership makes a deal, the process will head to the courts. It is unlikely the Democrats’ competitive theory will prevail, but the judge’s changes to balance population will likely not be as favorable to Republicans as their maps. In a likely low turnout election, with no overarching personality or theme motivating voters, get-out-the-vote techniques become more important. Systematic, repetitive voter contacts are used to remind voters to fill out their mail-in ballots. Each candidate is working to turn out his or her vote. Denver mayoral voter turnout has declined since the hard-fought elections of 1983 and 1991. This year’s new mail-back election makes predicting turnout difficult. Active voters are about the same this year as 2003 when 113,520 out of 244,398 voters, or 46 percent, turned out. In 2003, 18 percent of voters used absentee mail-back voting. This year, nearly all voting will be mail-back. Gene Block, UCLA Chancellor, takes off the gloves. He reminds California politicians they have benefited from the UC system and now have irresponsibly abandoned it. UCLA also has an aggressive alumni website directing the alumni toward political action. Candidate John Hickenlooper was 10 points up in the April 23 poll taken for the Denver Post 13 days before the May 6 general election in 2003. Ari Zavaras had faded to third place with 12 percent, and Don Mares, the City Auditor, was in a solid second. Legislator Penfield Tate surged, and although he didn’t make third, his move gave the final days a bit of drama. Hickenlooper won by 21 points over Mares. This year, the only published poll (a Denver Post a robo poll) shows the top three candidates bunched at 22 percent each for Chris Romer and James Mejia, with Michael Hancock in third (18%). Final momentum or a candidate stall could open the race up by 5 to 10 points between now and May 3, given the high percentage of undecided and weakly decided voters. Congratulations to Colorado Springs Gazette editorial page editor Wayne Laugesen for a tough editorial taking on the advertising in the Colorado Springs’ run off mayoral election. Colorado Springs first mayoral election after creating a new strong mayor position, at least partially modeled after Denver’s system, pits a rare Colorado Springs liberal Richard Skorman against a more conventional conservative businessman. Skorman, in a preemptive attack, runs an ad claiming Steve Bach is a developer responsible for all the evils liberals and environmentalists dislike. Laugesen believes it is a distortion and hammers it. Skorman writes a response effectively making his case. Whether the editorial restrains the next wave of campaign advertising remains to be seen. Denver, Colorado – The Denver Public Schools’ performance rating had declined during the last decade, and now less than one-third of Denver voters rate its performance positively. Of special concern for DPS is the fact the children of the constituencies it most schools offer the lowest ratings – overall 21% poor rating, Hispanic voters 28%, African-American voters 34% and Anglo voters 19%. 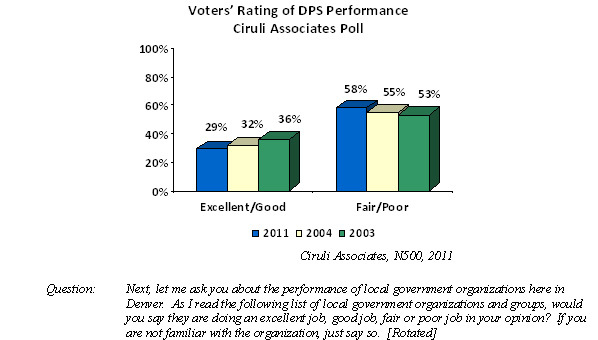 The survey was conducted by Ciruli Associates with 500 likely Denver voters from March 28 to April 12, 2011. The statistical range of error is ±4.4 percentage points. If the May 3 mayor’s election is decided by minority votes, James Mejia has an advantage. In a recent Ciruli Associates poll done with live interviewers (versus the Denver Post robo poll), 11 percent of the likely voters were Hispanic and 7 percent were African-American. Federico Pena’s close elections in 1983 and 1987 were made possible by exceptional Hispanic turnout when there were fewer Hispanics in the electorate. Denver voters are more liberal than either middle-of-the road or conservative, which is significantly different than voters statewide. African-American Denver voters are the least likely to be conservative (11%) and Hispanics are the most likely (32%). More than half of Denver voters are Democrats. Hispanic and African-American voters are much more likely to be registered Democrat. In the recent Denver Ciruli Associates poll, 27 percent of the interviews were conducted on cell phones and 100 percent were registered voters because voter names were drawn from current voter registration lists. The Denver Post robo poll did not call cell phones and only asked voters if they are registered. A percentage either misstate their registration status or are mistaken about their status; for example, due to recent purges of inactive voters. The latest Denver Post robo poll must be of concern for Chris Romer whose campaign appears to have stalled. In a poll of late March, he had 20 percent and is about in the same position (22%). Both James Mejia (22%) and Michael Hancock (18%) doubled their numbers since the March survey. • There will be a runoff. Romer who appeared to have momentum in March is now below a quarter of the vote. • Romer still has an advantage with high name identity and the most money for advertising during the last three weeks. • Mejia’s base is larger than Hancock’s if Hispanics will turn out. A Ciruli Associates poll in early April shows 11 percent of the Denver electorate is Hispanic and 7 percent Black – a 4 percent difference. • The also-ran candidates are holding 32 percent of the vote. A small amount may shift to the frontrunners by Election Day, but most likely the top three candidates will be splitting about two-thirds of the vote. Should the two at-large Denver City Council seats be abolished? The race is largely invisible, and the two winners could take their seats with barely 20 percent of the vote. At a recent forum, the candidates gave a stout defense of having someone on council with a citywide perspective. But, comments from the sparse audience indicated that the at-large concept was little appreciated. Most people thought district seats were harder fought by candidates and more closely followed by voters. The Denver Young Democrats sponsored a forum April 13 in the Washington Park neighborhood. Candidates were well-versed, but gave mostly cautious and conventional answers. Josh Davies - A business background. Well-spoken. Rich Gonzales - Long city experience with the most management experience and more conservative viewpoints. Robin Kniech - The liberal/labor candidate. Debbie Ortega - Did not attend. Jesse Shelmire - Young with environmental orientation. In the lightning round, they universally said they would let Police Chief Whitman go and vote against the pay raise. They mostly waffled on the pit bull ban and a garbage fee. A majority of the leading candidates for Denver mayor have specifically said Police Chief Gerry Whitman is out or they refused to defend him. The debate now is about would an insider or outsider replace him. Changing the Chief with a new administration is common. And, Whitman has been long serving. A new mayor would like some fresh leadership to put recent police behavior controversies behind him or her and gain some fresh perspective and support with the upcoming negotiations over police pay and work rules. Colorado Springs and Fort Collins both had municipal elections on April 4. The two larger Colorado Front Range cities are dealing with significant water projects. In the Colorado Springs election, the billion dollar plus Southern Delivery System was a campaign topic. A group of candidates associated with Douglas Bruce ran campaigns for mayor, at-large and district city council positions. They criticized the project and the associated rate increases. They lost. Bruce received fewer votes than one of his less well-known allies in the at-large position. But, the defeat was reasonably close, and water and rate increases are likely to remain issues. Douglas Bruce’s problems have continued. He was just indicted for tax evasion. In Fort Collins, the balance between environmental radicals and environmental moderates was maintained. But, mayoral winner Karen Weitkunat represents the moderate faction in local politics. Also, two incumbents were re-elected, which continues the one-vote majority for what has, thus far, been hostile to a host of new water projects. Weitkunat’s campaign was based on jobs and a strong economy, and it gives her some momentum to help guide a more reasonable dialogue. Denver voters will start voting in a couple of days, but without a lot of excitement. The race for mayor has attracted more money than passion. In 2003, at this point, John Hickenlooper was beginning to generate buzz as he received the Rocky Mountain News’ endorsement, saw a surge of fundraising from $600,000 to $1 million, and grabbed the Denver Post’s endorsement mid-April. If the one poll published and the contributions reflect the current state of the race, Chris Romer makes the runoff, but below 50 percent. The second place finish will likely be close, but will depend on final candidate turnout efforts and advertising. All the top candidates have TV ads up, and some are good, but none seem to be generating any buzz. Surprisingly, candidates are attending two and three forums a day, but the effort seems to be more exhausting than enlightening – and, it certainly hasn’t generated much controversy or major differences. Maybe Romer’s best chance of winning this outright is pure boredom – voters may just want to get it over. In an open letter to the Denver Business Journal, Jim Hannifin, a long-time Colfax Avenue small business owner, argues Denver city government is basically anti-small business. He believes this in spite of eight years of pro-business mayoral leadership from John Hickenlooper. RNOs are Hannifin’s main complaint. Registered Neighborhood Organizations, some of which are just front organizations for a few anti-growth, not in my neighborhood activists, have Excise and License and Planning departments in their grip. Public Works, he states, is just not very commerce-oriented and has a myriad of inappropriate and inflexible rules and procedures. In a mayor and council election that has been mostly devoid of issues, maybe a discussion of jobs requires taking on the long overdue problems of Denver’s bureaucracy. Michael Booth’s Denver Post profile of Michael Hancock described Hancock’s impoverished and difficult childhood and his incredible up-from-the-bootstraps success. Hancock is in third place in fundraising and early polling. He will need a breakout issue to become the second place finisher. His pay raise vote, while not a deal killer, is a problem, and has already been used against him in TV advertising. Hancock has shown he knows how to get things done. A couple of year ago when the Denver Public Library’s position in the bond package was threatened due to the effort to reduce the amount of the package, Hancock got media coverage with his advocacy of the Library, which happened to have two new facilities in his area. The branch libraries stayed in the package. 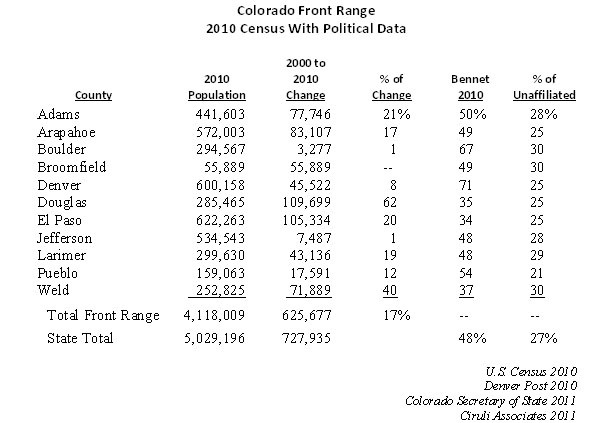 The 2010 census affirms the long-term growth trends that have shaped Colorado’s policy and politics since the 1970s. The Front Range counties dominate the state’s population (82%), with the Denver metro area maintaining its position as the state’s population hub (55% of state’s population). Counties with land and growth-friendly policies are the last decade’s biggest gainers (Douglas, El Paso and Weld counties). 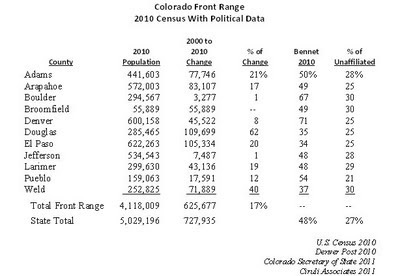 The latest census data also makes clear that Colorado’s competitive politics will continue. The 2010 U.S. Senate race, decided by less than 30,000 votes out of 1.5 million cast, is displayed in the chart below with 2010 census results and the percentage of unaffiliated active voters in Colorado’s Front Range counties. • The bulk of state voters are concentrated from the Wyoming border through the Pueblo-Huerfano county line (82% of state’s voters). The remaining voters are on the High Plains (3%) and 15 percent are on the Western Slope. • The GOP’s best large Front Range counties of Douglas, El Paso and Weld grew above the state average of 17 percent. The three of them account for nearly 40 percent of the state’s 10-year population increase. • The Democrats’ best counties of Boulder, Denver and Pueblo grew the slowest along the Front Range – only 1 percent in Boulder, 8 percent in Denver and 12 percent in Pueblo. Much of Pueblo’s growth has been in Pueblo West, an area more prone to vote Republican. • The most competitive large counties that gave Michael Bennet a close victory in 2010 were Arapahoe, Jefferson and Larimer, each of which had been dependably Republican 20 years ago and are now reliably swing counties that will support popular statewide Democratic candidates. Arapahoe’s swing to battleground status is explained by the growth of Aurora. The city now has a majority of non-white residents. Jefferson County’s growth stopped abruptly in the late 1990s. Lakewood and Wheat Ridge are becoming cities with higher proportions of older populations. Much of the county’s new growth has been Hispanic voters along the Denver/Jefferson county line. Larimer County is closely balanced with moderate Republican and conservative groups, mainly outside of Fort Collins, balanced with environmentally active new residents augmented with liberal CSU students and staff. • More than a quarter (27%) of active voters are unaffiliated. These were voters that turned out in the 2010 election. When inactive voters are added to the voter base, a third (34%) of voters are independent because inactive voters (i.e., not voting in 2010) tend to be more unaffiliated (40%). Even with reduced numbers of active voters, unaffiliated voters are the second largest voter bloc in Boulder, Denver, Douglas, El Paso and Weld. • Republicans lost the highly competitive U.S. Senate race in spite of having turned out 108,000 more registered Republican voters than Democrats in 2010 (731,000 to 623,000). They lost many moderate Republicans and unaffiliated voters that might have voted for them given the good Republican year. Can Romer Win the Race Without a Runoff? Chris Romer continues to pace the field in fundraising. The only published poll places him at 20 percent, with 40 percent of voters undecided. He’s in the runoff, barring a McInnis-like crisis. But, hitting 50 percent plus to win outright will require a collapse of most of the field, which has three other candidates with the money and a sufficient base among voters to be competitive the last month. Romer has consistently raised about a third of all the money taken in – now more than $2.8 million. Although he received the Denver Post endorsement, and will no doubt use it in his advertising, it has created little buzz so far, possibly due to the lack of new coverage about it and the rather ambivalent tone of it. Hence, Romer leads into runoff, but still doesn’t command the field. He will need a burst of public relations good news to enliven his campaign to get through it without a runoff. The mayor’s election of May 2011 will not be decided by a youth vote. Political activists under 30 years old manage several campaigns and form a significant portion of the staff and volunteers. But, they represent barely 5 percent, or 5,000 to 7,000 votes, of the electorate (depending on final total turnout) and they won’t bloc vote. More than half of this electorate will be older than 50 and a quarter will be above 65 years old. Auditor Dennis Gallagher will win that vote hands down. The most interesting new voters who are under 45 years old are in Denver’s redeveloped Lowry, Stapleton, LoDo and Platte Valley, and hot growth areas, such as Cherry Creek North and Highlands neighborhoods. Will Denver Post Endorsement End the Race for Denver Mayor? At the end of March, only about half of the Denver electorate was paying attention to the mayor’s race. But, with the race entering its final month and the Denver Post endorsing Chris Romer on Sunday, April 3, voters will step up their decision-making and candidates’ positions will consolidate. Romer entered the race last January with three advantages, which the Denver Post endorsement will strengthen. His last name being a statewide political brand gave him the highest name identification of the field. A recent poll conducted by the political website ColortadoPols.com confirmed Romer’s name identification advantage. His 51 percent name identification was accompanied by the highest favorability of the top five candidates (40%) and the largest early voter share – 24 %. His second advantage was financial connections among the big donor Democratic patrons. And, indeed, he has substantially beaten the field in fundraising (latest total: $1 million). Finally, he started with a strong network of Democratic Party operatives accumulated from years of party activism (including helping John Hickenlooper) and, of course, association with his father, Roy, who left office with a good reputation and is active in the campaign. The Denver Post endorsement will strengthen his name identification, add to his fundraising and attract even more political operatives who want to back a winner. The endorsement of the only metro daily adds considerable momentum to the campaign and makes Romer now the candidate to beat. The Denver Post is the most powerful media organization vetting the candidates. It brings a credibility to a candidate who is little known outside highly attentive voters. Newspaper endorsements, often from the Rocky Mountain News, have had major impact on Denver mayoral races. Pena, Webb and Hickenlooper each got the Rocky’s endorsement, made the runoffs and became the ultimate winners. And, the Post’s editorial strategy tends to micromanage the campaign environment, usually to the end of helping their endorsees and to the disadvantage of the remaining field. Governor John Hickenlooper, formerly Denver Mayor, maintains his long-established popularity with Denver voters. Hickenlooper burst on the political scene from a business career in 2003 and began his long reign of political popularity. Polls during his career have repeatedly recorded his favorability at 70 percent or higher. In a poll published by the political website ColoradoPols.com for the Denver mayor’s race, Hickenlooper has a 77 percent favorability rating (conducted by RBI Strategies, a Democratic campaign firm). The poll conducted to measure the status of the mayoral candidates also rated the three most recent mayors. All three – Pena, Webb and Hickenlooper – maintain considerable affection with city voters. Current ratings are affected by the remembered history and current image of the mayors. Hickenlooper’s advantage, besides the recency of his service, is that he has been able to combine popularity among Democrats (86% favorable) with high levels of support among unaffiliated voters (71% favorable) and considerable support among Republicans (58% favorable). His current rating with Republicans is good in spite of a November partisan election (even if not much of a campaign) and now serving as the Democratic governor. Pena as Denver’s most activist recent mayor and its most liberal, always had opposition among Republicans (only 35% favorable) and middling favorability among unaffiliated voters (51% favorable). He does maintain a strong position with Democrats (70% favorable). Webb, while a high-profile Democrat (73% Democratic favorable), kept a good image with unaffiliated voters (61% favorable) and was accepted by a plurality of the GOP (43% favorable).